The venue where you want to put the plastic ice skating rink business should have very high traffic of people of your target group. Depending on the ice sport business concept the target group can be families, children, youngsters or adults. Or are you building an ice hockey school business and you need to be in an area of a lot ice hockey wanna-be NHL stars? Ideally high traffic venues for your synthetic business are shopping Malls, Leisure parks, Casinos, shopping districts etc. Yes, the surface should be as flat as possible. Why? First and fore-most, unless you want your plastic ice skating rinks customers experience a wavy skating experience, a skating rink should be flat. Second, it is much easier and faster to install a synthetic ice surface on a flat floor than on an uneven floor. Dovetail cut synthetic ice panels will definitely not work on an uneven ground because they are not vertically locked and so the seams of the plastic ice sheets will be felt. Tongue and groove synthetic ice panels are locked both horizontally and vertically, therefore are more tolerant to be installed on a less even surface. However still installing of tongue and groove plastic ice sheets on an uneven surface can take considerably longer. Yes, you want your synthetic ice rink customers to have easy access to your facility and loosing time finding a parking space. Imagine the grandmother brings her granddaughter to go ice skating on your plastic ice rink but she is not anymore in the shape or mood to go skating. You will need to have a way to keep her entertained so that it is a fun experience for her every time as well and she will be happy to come back again with her granddaughter. So either you have some cafeteria or Food & Beverage facility right next to rink or offer it yourself as part of your overall synthetic ice rink business. In most countries you need by law to give access to lavatory facitliy at your plastic ice rink business. If you manage a synthetic ice rink training facility for ice hockey or figure skating you should consider having a changing area and a locker area. Make sure the facility already has this kind of installations so that you can decrease your investment costs for your artificial ice skating rink business. If you are not sure if the location you have chosen for your synthetic ice skating rink business is the right one, then just contact our experts Send a floor plan and photos of the location you have in mind and we will analyse it for you. 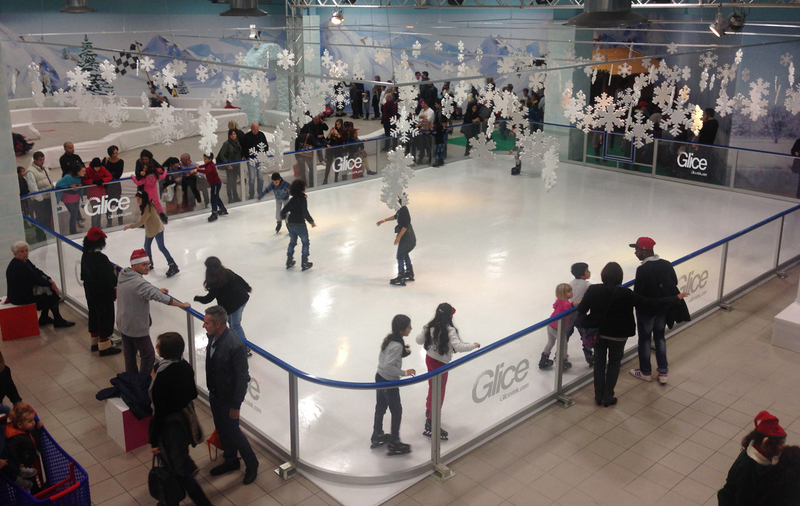 Since we have installed over 150 Glice rinks in over 50 countries, we have a vast experience about which locations work and which don’t.